Salinas, CA (May 9, 2013) Sun Street Centers announced today that the IMPOWER program has awarded the Pueblo del Mar Family Recovery Community $15,000. The donation is for scholarships to be used over a 2-3 year period for women in recovery from addiction seeking to improve their skills and become leaders in their communities. 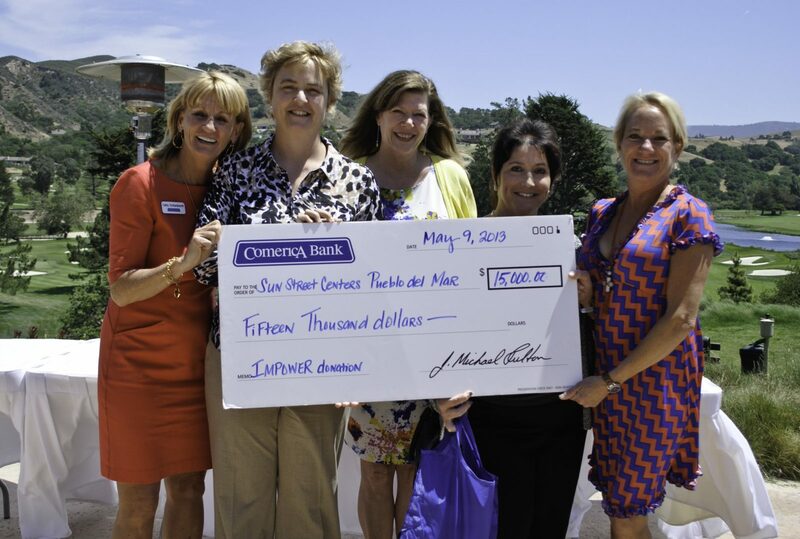 IMPOWER, a collaboration of local business women and the Salinas Area Chamber Foundation, is women investing in women as leaders. This program raises money to provide scholarships to women and girls in Monterey County and impact the community in other areas. IMPOWER stands for bringing women together to INSPIRE, MOTIVATE, PREPARE and ORGANIZE WOMEN to ENGAGE and REINVEST. Sun Street Centers’ addiction recovery program in Marina has served over 1350 women and children in the past ten years. These families have gone on to lead clean and sober lives. The IMPOWER grants will help women attempting to improve their education and employment skills, to become role models for their children, and leaders in their home towns. The donation for $15,000 was presented by IMPOWER Executive Committee members, Margaret D-Arrigo-Martin of Taylor Farms and Cathy Schlumbrecht of Comerica Bank, who added, “It is with great pleasure and a full heart that IMPOWER has this opportunity to present the $15k to help women in our community to get the education to be in a position to take care of themselves.” Margaret and Cathy are pictured here with Sun Street Center’s Board President Anne Leach, Development Director Sheryl Merrill and CEO Anna Foglia.